New Podcast, TOCA Backstage, Available Now! TOCA is pleased to announce our brand-new podcast, TOCA Backstage! On TOCA Backstage you’ll hear from the artists coming to our stage about how they got started and what you can expect from their show. 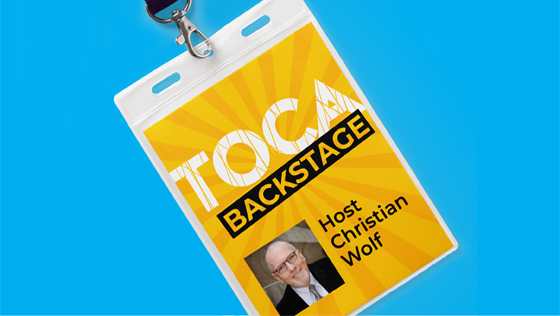 Chris Wolf, Executive Director of TOCA and interviewer extraordinaire, gave us some insights into how and why TOCA Backstage came to be. Q: What was the impetus to start this podcast? CW: Well, the artists we bring in aren’t always household names. People don’t know them. I’m hoping that if we can get these artists in front of people, BEFORE the show, to give some backstory and background, that people will feel inspired to see the show – and buy a ticket. I see all the acts before I bring them to our theaters, and I know how talented the artists are. But it’s really hard for people to be invested in spending time at a show when they know nothing about it. This podcast will, hopefully, put the performers in front of more people and get them interested in actually seeing the show! Plus, it’s all about conversations. I want the conversation to be a real conversation, not a sales pitch. I’m talking to the artists about their own journey and how they’re inspired to do what they do. Q: Do you have a goal for this podcast? CW: Well, initially the idea stemmed from wanting to sell more tickets, but then I thought more about it and realized that I have the artists’ attention for 20-ish minutes, why not also get some advice for up-and-coming artists? I want young artists, local artists, to hear how these performers got started, so that they’ll feel inspired to start their own career in the arts. When we do the South Bay’s Got Talent competition, I see how much amazing talent we have right in our own backyard, I want them to know it’s ok to follow your passion. But not just follow their passion, learn steps they could take in their own lives to turn that passion into an actual career in the arts. The bottom line is that TOCA Backstage is about the artist and the experience the patron has. If talking to these people helps the audience connect to the artist or helps a young person find their next steps to follow their passion, then it’s worth it. Q: What’s coming up next? CW: I’m trying to get every single artist coming to TOCA this season on the podcast. Then I’d like to branch out a bit, maybe talk to artists from the community or local theater, maybe agents or managers. Give a different perspective or information about the business side of the arts. To hear the interviews, you can find TOCA Backstage at Bluberry Podcasting or Apple Podcasts. Check back for more platforms, soon!